Like Lyman Epps, Sr., James Henderson hailed from Troy, New York and migrated to Timbucto. Henderson left Troy with his wife, Susan, and five children in 1848 and they became some of the first African American settlers in North Elba. He was a cobbler by trade and owned a shoemaking shop in Manhattan prior to moving to Troy. In Manhattan he also operated an evening school for both adults and children. Upon moving to Troy around 1847, he became a representative for local African Americans at national conventions where he fought for suffrage reform. Henderson re-opened his shoemaking shop once he and his family had settled into land relatively close to the greater community of North Elba. James Henderson had been amassing an impressive legacy in North Elba when he tragically froze to death in 1852. His family moved back to Troy shortly thereafter. Very little is known about Henderson’s success as a farmer. 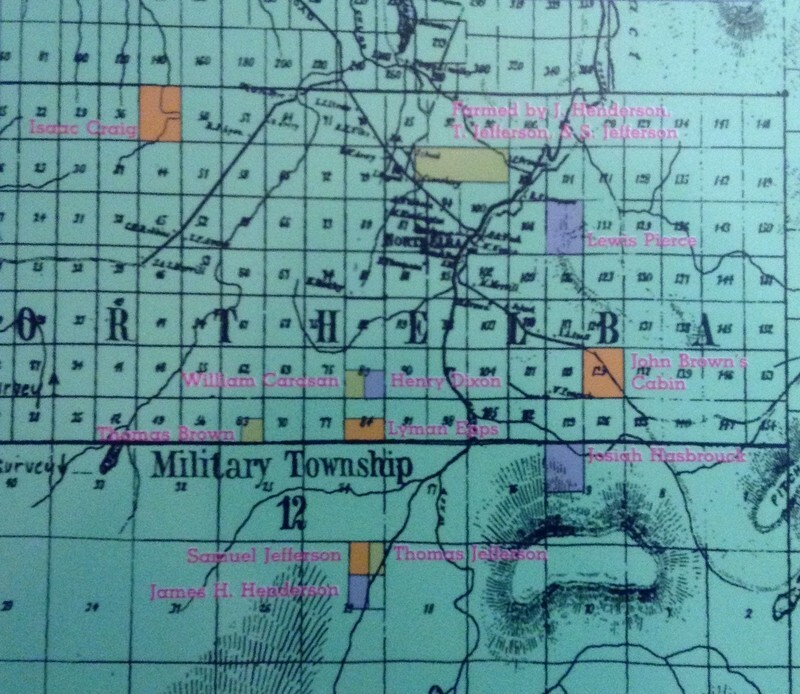 A map in the museum exhibition “Dreaming of Timbuctoo” identifies several plots of land belonging to Henderson and brothers Thomas and Samuel Jefferson. The three men were each given forty-acres of adjoining “Smith Land” in the northeast corner of Lot 23. It is likely that the three men found their land claims to be inaccessible wilderness, so together, they leased Lot 93 which was much closer to North Elba. The land they settled on belonged to a man who had a lease-to-buy contract with Gerrit Smith. In three years Henderson and his family greatly improved their settlement by cultivating the land and building a house. Along with John Brown and his son Jason, James Henderson and the Jefferson brothers sought to purchase the land claim to Lot 93 from Smith. 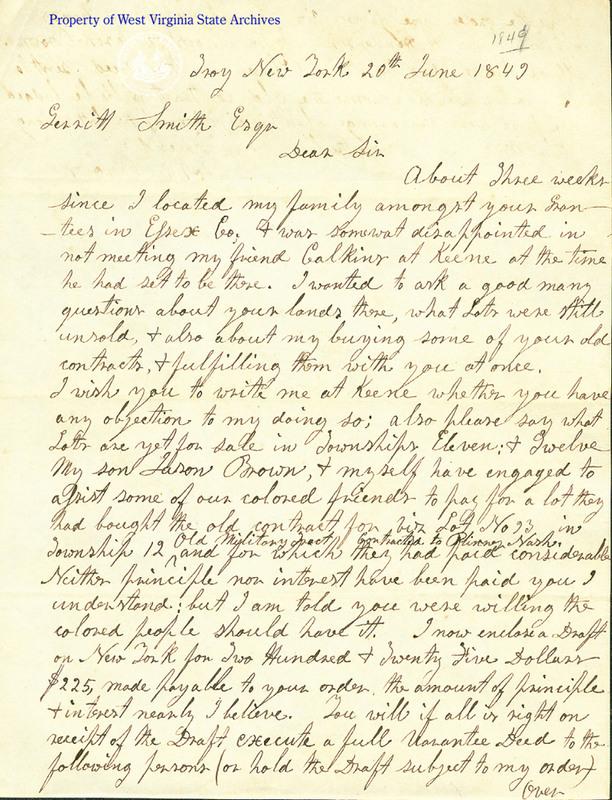 Less than a month after arriving in North Elba, on June 20, 1849, John Brown wrote to Gerrit Smith offering to help his neighbors purchase the land claim. He forwarded Smith a draft of two hundred and twenty-five dollars and planned to split the deed between himself, his son, Henderson, and the Jefferson brothers. This plan, however, never came to fruition. The Henderson family likely continued to lease the land with the Jeffersons. According to late local historian Mary MacKenzie, at one point a total of sixteen people lived on Lot 93—eight from the Henderson family and eight between the two Jefferson families. Several documents suggest that the Henderson-Jefferson settlement was the original community given the name “Timbucto.” A letter written by Henderson was published in Frederick Douglass’ North Star newspaper on February 16, 1849. He addressed his location as being “West Keene Timbucto, Essex Co.” There are several surviving documents of John Brown and his family using the name Timbucto to describe a location, and all imply that it was a separate place from their settlement. Samuel and Thomas Jefferson were also early African American pioneers of the Timbucto community. Samuel, the older of the two, was believed to have been born in Albany, New York and moved to North Elba in 1848 with his wife, Jane, and two sons. 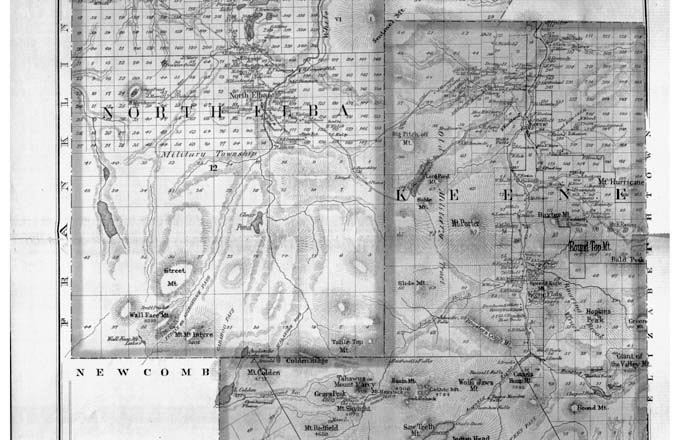 In an account published in Douglass’ North Star on November 10, 1848, it appears that Samuel traveled to Troy, New York to speak to other “Smith Land” grantees about North Elba. Samuel was reported to have spoken favorably about the area, conceivably motivating Thomas to move his own family to Timbucto in the spring of 1849. Thomas, like his brother, was born in Albany and moved his wife, Jane, and two sons from Troy to Timbucto. While on their way to Timbucto in the spring of 1849, Thomas Jefferson met up with John Brown and his family in Westport, New York. The Browns were making their way to North Elba as well, and hired Thomas to drive their team of horse for the duration of the trip. For her biography, titled, The Life and Letters of John Brown, Ruth Thomas retold the story of her family’s journey to North Elba with Thomas Jefferson: “At Westport he [John Brown] bought a span of good horses, and hired Thomas Jefferson (a colored man, who with his family were moving to North Elba from Troy) to drive them. He proved to be a careful and trusty man, and so father hired him as long as he stayed there, to be his teamster. Mr. Jefferson by his kind ways soon won the confidence of us all. He drove so carefully over the mountain roads that father thought he had been very fortunate in meeting him.” Thus began the friendship of John Brown and the Jefferson brothers. The Jefferson brothers did not, however, remain in Timbucto or the North Elba area for long. They left before the 1850 census but returned around 1854. By the 1860 census neither Samuel nor Thomas were living in North Elba. Lot 93, Township 12 is located where the Lake Placid Airport and North Elba Athletic Fields are today. RJ Lara, “The Henderson-Jefferson Timbucto Homestead,” UpstateHistorical, accessed April 18, 2019, http://upstatehistorical.org/items/show/57. Essex County, New York. "Essex County Map Viewer." Fountains Spatial, Inc. Essex County Real Property Tax Services. http://essex-gis.co.essex.ny.us/ Jones, Katherine Butler. "They Called it Timbucto." Orion, Winter 1998. http://katherinebutlerjones.com/content/orion_timbucto.pdf MacKenzie, Mary. The Plains of Abraham: A History of North Elba & Lake Placid. Edited by Lee Manchester. Lake Placid, NY: Lake Placid Public Library Edition, 2010. http://www.cefls.org/ebooks/plainsofabraham1.pdf Manchester, Lee. "John Brown, revisited & revised." Lake Placid News. April 8, 2005. http://www.aarch.org/wp-content/uploads/2014/09/050408VLPJohnBrownrevised1.pdf McDaniel, W. Caleb. "In Search of John Brown’s Timbucto, Part I." Rice.edu. August 11, 2010. http://wcm1.web.rice.edu/john-brown-timbuctoo-part1.html New York State Museum. "NYS MUSEUM OPENS EXHIBIT OCT. 8 REVEALING LOCAL TIES TO 'TIMBUCTOO'." Office of Communications. October 1, 2003. http://www.nysm.nysed.gov/press/nys-museum-opens-exhibit-oct-8-revealing-local-ties-timbuctoo Sanborn, F. B. The Life and Letters of John Brown, Liberator of Kansas an Martyr of Virginia. Boston: Roberts Brothers, 1885. Stauffer, John, ed. The Works of James McCune Smith: Black Intellectual and Abolitionist. New York: Oxford University Press, 2006.